Today is Monday, June 21, 2004. My first ever visit to the Campbell Games is coming up on Saturday. I stayed home from work today with a head cold—had to cancel a private lesson yesterday—and spent most of the day in front of the computer working on a couple new reference pages for this website. (I swear, if I spent half as much time practicing as I do as on the computer, I'd be in Grade II by now.) 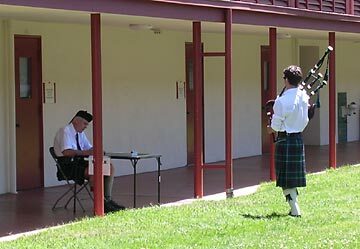 There's no piobaireachd at Campbell—that's out unfortunately—so I'll be competing in Slow March again and a 2/4 March for the first time. The slow air should go pretty well, as long as I can keep my fingers from turning a low-A taorlauth into either a double-A or simply a low-A. I've been having occasional issues with "finger lock"! I'm not sure how I'll do in the 2/4. If I can keep the tempo slow and even, I should do pretty well. Marching is not required for Grade IV, so I'm not going to. Though if I could master solo marching, it would help me keeping even tempo. But I haven't had time to work on it as much as I'd need to. Tuesday, June 22, 2004. Stayed home from work again today, with stinging nose, watering eyes and coughing up material that shouldn't be in my lungs! Missed band practice tonight. Sigh. Four days to get better. Friday, June 25, 2004. Twelve hours from now, my two competition events will be over and if things go well, I'll be waiting for results to see if I made the playoffs. I'm still taking over the counter medications for my cold, still coughing. Last night I had a hard time stopping coughing. I had a lesson with my instructor today. Seemed pretty pleased with my embellishments overall. Bit of work to do on timing yet. Holding the long notes longer and not cutting them short. The all-important expression stuff that really makes a tune sing. Well, I need some sleep, up early tomorrow. Saturday, June 26, 2004. Well, I slept pretty crummy last night, awake every hour or so—had another coughing fit—but felt decent, took some Sinutab. Kip Nead came by at 7:15 for the less than an hour drive to Campbell. Arrived with plenty of time to warm up and look around the place. Lots of bathrooms—this is a good thing, especially when trying to remain hydrated on a hot day somewhere around 80 degrees! Ran into Tom Jenkins another piper from the region, he tipped me off that registration was not required at the WUSPBA tent and not to bother visiting it. I was tuning up and noticed Zach Duncan (also in Santa Cruz Pipes & Drums) was competing and I helped him tune up along with another band member— but noncompetitor today—Alex Willingham. I made my way to Table 1 for the slow march competition scheduled for 9:06. Tried a new tune this year, Hearken My Love. Jan Richey confers with the steward after my performance at Table 1.
drones close. F sharp slightly. overall chanter good. Execution: continue to work on tacchums—bar 1—close but not always quite clean. Overall quite clean. Expression: Well played—you could put a shade more holding prior to taors eg although you are well on your way. I felt my slow march event went pretty well, though I was losing my lip for the last half of the tune! I felt I didn't hold the long notes long enough, and this was reflected on my sheet. I didn't have much time to muse as my 2/4 March event was scheduled for 9:12. Drones - bass a bit overpowering the overall balance. Chanter - okay, maybe a bit flat. 3- choke, hold the notes before the grips in the 1&3 phrases. 2- " " " " "
4- expression better here, the part flowed better. Good potential, work on exercises, especially for your grips. I was not feeling confident at all for my 2/4, I was worried a bit about my lip after the slow march. I started out too fast—which Jay Salter, my instructor, had warned me about—which was reflected in the judge's comment about the grips. I had tried to start slow, but away it went! When I got into the second line of the second part, I realized that I wasn't sure if I'd accidentally played the first part three times! I figured I'd press ahead, which I did, played the second part one time from there out and moved on into the third part. I felt inconsistent in my tempo—i.e. "don't rush the pick-up notes"—I still need work there. But, at least, my first 2/4 attempt is now part of an experience foundation. Just a quick side note on the comment "Chanter - okay, maybe a bit flat." In a band situation, a chanter can be flat—when compared to a master chanter. In solo piping, a chanter really can't be flat—a note can be flat or sharp relative to the other notes, but the whole chanter can't really be called flat or sharp as that is an arbitrary opinion regarding what is the ideal pitch. This was the judge's pipe major experience creeping in a bit into a judging situation. With hindsight, I imagine the judge would agree. I hung around with Paul Llewellyn (also in S.C. P & D) and his nephew Chris for a while, giving WUSPBA time to get the results tabulated. We migrated over, and found I'd placed 3rd in my leet of about 7-10 pipers—there was a "3" written in the upper right corner of my sheet—Zach had placed 2nd, so we'd be in the playoffs. I would play first, Tom Jenkins second, Zach would play third, followed by three more pipers, all at Table 4. Kip was moving on to his 2/4 March playoff at Table 3. Once the Grade III events were complete, the WUSPBA folks posted times for the two Grade IV playoffs, my time was 11:10. It ended up starting about 20 minutes late. 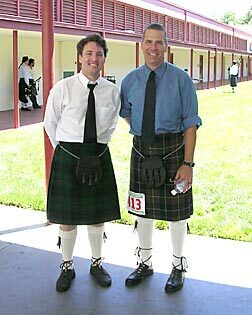 "Piping doesn't rate a golf cart," it was explained to me and the judges had a ways to walk from the registration tent to the competition venue tucked in between a series of buildings. I retaped my F a bit, based on Jan Richey's comment. I helped Zach tune up again—as a matter of fact, if he hadn't have borrowed my cell phone to call his dad earlier, I wouldn't have been able to call his dad to tell Zach was in the playoffs! I felt pretty confident for the event, I knew I could play better than my first attempt and hold those notes for more expression. 1. [two check marks] articulate E & F doublings. Separate 2 gracenotes more. 2. [two check marks] intonate high hand notes i.e. blow the sound you seek to hear. Very nice pipe sound. Work on top hand blowing & gracenoting. Zach Duncan plays for Judge Naismith in the slow march playoffs. Unfortunately, his bass drone cut out. Tom Jenkins (left) and Paul Llewellyn listen on to the different competitors in the slow march playoff. So what to work on for the future? Open up some of my embellishments, put some really serious work into my 2/4—and finish getting my piobaireachd ready for Monterey the first week in August.